For private equity firms operating in the retail industry, one door may be closing. But another is opening. On one hand, recent years have brought a flurry of bankruptcies for traditional big-box retailers backed by PE, as companies with outdated business models continue to fall behind their more streamlined peers. But some firms have been able to capitalize on that very same trend by embracing a more specific niche: ecommerce. The explosion of interest, though, may be ending. As you can see, activity experienced a dip last year and is on pace to roughly level off during 2017. 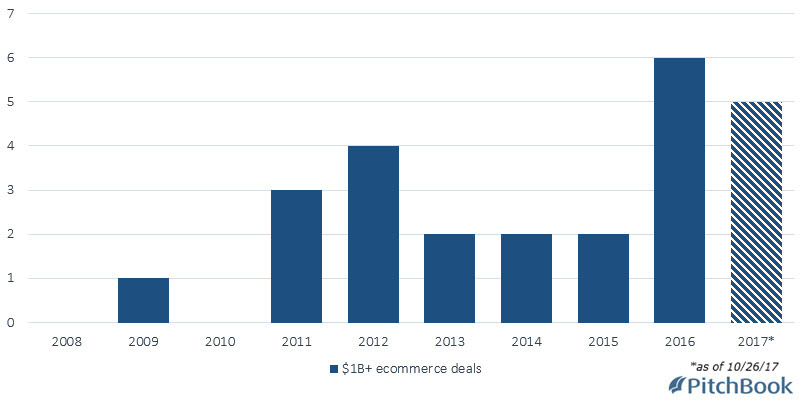 While deal flow remains extremely elevated compared to a decade ago, private equity's endeavors in ecommerce may now be reaching a more mature state. Interestingly, a majority of global ecommerce activity in the past 10 years has taken place in Europe—51.2%, according to PitchBook data, compared to 36% in the US. Within Europe, England has been home to nearly 23% of those deals, followed in frequency by France (18.5%), Germany (14.3%) and Sweden (10.7%). Dating back to the start of 2008, there have been 25 completed private equity transactions in the ecommerce space worth at least $1 billion. And 11 of those deals have occurred in the past two years, including five so far during 2017. While Europe has been the home to a majority of private equity deals of all sizes in the ecommerce space, when it comes to mega-deals, the continent is a bit player. About 64% of the billion-dollar transactions since the start of 2008 have occurred in the US, per PitchBook data, while Europe has been home to just 9% of such moves. That figure ranks third in terms of regional frequency, behind the US and Asia, which ranks second at about 23%. Europe once again assumes a central position in the ecommerce space, though, when it comes to the investors who've conducted the most deals. Four of the seven busiest PE firms in the sector since the start of 2008 are located in the region, according to the PitchBook Platform, including No. 1. 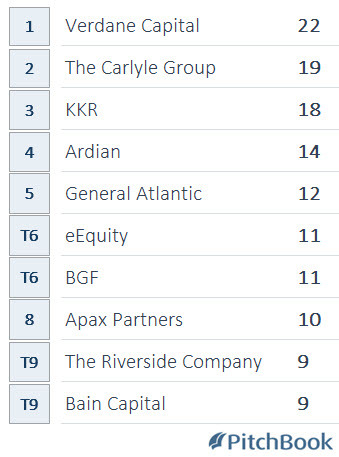 While the list includes some growth-focused firms, such as BGF and General Atlantic, it also features some of the biggest names in private equity—KKR, The Carlyle Group and Bain Capital certainly qualify. The fact that such major, mainstream firms are among the top investors in ecommerce is evidence of the industry's growing prominence: The recent rise in deal flow has been driven largely by heavyweights. In April, PetSmart agreed to buy Chewy.com, a seller of pet food and other products, for a reported $3.35 billion in the largest ecommerce takeover ever of a company that operates strictly online. PetSmart, meanwhile, has been PE-backed since 2015, when a consortium led by BC Partners bought the business for a reported $8.7 billion. Since then, the company has completed only one other add-on deal besides Chewy.com, purchasing online pet adoption platform AllPaws in 2016. Another major recent PE target in the space was Vivid Seats, the operator of an online ticketing platform and the recipient of a strategic investment from GTCR in May. That deal came after reports earlier in the year that Vista Equity Partners was seeking to sell Vivid Seats for up to $1.5 billion; Vista hadn't backed Vivid Seats for long, buying the business for a reported $850 million in 2016. The firm maintained a stake in Vivid as part of GTCR's transaction with the company. Blue Nile is a Seattle-based ecommerce business that sells diamonds, gemstones and other jewelry. After being publicly traded on the NASDAQ since 2004, the company agreed in November 2016 to be acquired for about $500 million in a take-private buyout by Bain Capital and Bow Street. The investors paid a 34% premium to Blue Nile's stock price to complete the deal in February, an indication that PE investors are finding an opportunity for value in ecommerce. And finally, Chinese private equity firm Orient Hontai Capital announced a deal in September 2016 to acquire a majority interest AppLovin, the maker of a mobile marketing platform, in a deal valued at $1.4 billion. The company's Palo Alto headquarters is representative of the ecommerce space: Of the ecommerce deals to take place in the US in the past 10 years, about 22% have involved businesses based in California, nearly twice the amount of any other state. Ecommerce isn't the only emerging sector drawing PE interest—firms are also recognizing the SaaS sector as a source of profits.